Allergy Advice: Contains Gluten, Egg. Ingredients: Maltose (Gluten), Sugar, Palm Oil, Glucose, Red Bean (2%), Pork Gelatine, Sweetener (E420), Milk Powder, Salt, Stabiliser (E414), Egg White Powder, Colour (E162), Flavouring. 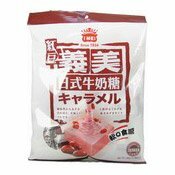 Simply enter your details below and we will send you an e-mail when “Red Bean Chewy Candies (義美日式紅豆牛奶糖)” is back in stock!